“Our goal is to attract the best riders and horses to compete and ensure equestrian supporters globally and locally are aware and motivated to buy tickets to various events throughout the ten days,” said Karen Poncelet, Marketing Communications and Community Relations Manager, The Royal Agricultural Winter Fair. The Royal Agricultural Winter Fair is the world's largest combined indoor agricultural and equestrian show. Now in its 95th year, the Fair takes place each November in Toronto, Canada. The Royal Horse Show, cornerstore of the Fair, is a world-class event that showcases the best of the best in equine sport and breeding. The 10-day competition attracts national and international competitors and features world-renowned entertainers. Maintaining awareness with the Equine industry internationally. Building a strong base of equestrian enthusiasts in the home city of Toronto. Educating the general public on the merits of equine events as both a family-friendly activity and a spectator sport. As a charity, the Fair relies highly on earned media to drive awareness and sees public relations as an integral function to reach and engage target audiences. The challenge is in creating a lasting campaign that builds excitement among the pros and the public alike. To maintain its regular cadence of communication with competitors, industry news outlets and the public, The Royal leverages Cision Distribution by Canada Newswire before, during, and after the November event. “We strive to create a heightened sense of anticipation within the industry with well-timed news releases and promotion,” said Poncelet. To cut through the news cycle clutter, Poncelet ensures every release is accompanied by compelling photography and video. "The Fair showcases champions across every imaginable agricultural crop and animal category, plus food, wine and art. There is no end to the visual opportunity this backdrop provides. It would be a real miss not to include it." Fair photography is consistently among the most downloaded content on newswire.ca. The main events for the Royal Horse Show take place in the evening, so results are not known until around 10:30 - 11 p.m. Despite the late hour, Poncelet and her team get to work preparing a press release announcing the nightly winners. Press release copy and the night's best photographs are then uploaded to the Online Member Centre (OMC) platform for immediate issue. “This is a change from previous years where our releases went out the following morning. By then the news was too old. Posting in real-time significantly and positively increased the pick-up rate, especially among local media outlets,” said Poncelet. Poncelet's crew is up before dawn assisting television morning show crews and stay until the evening press release is out. 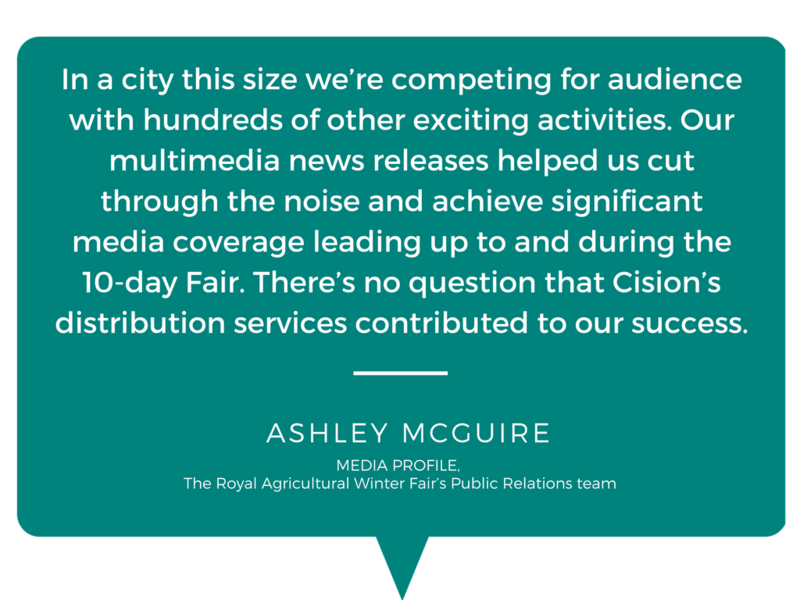 As the Fair progresses, the team relies upon the attention to detail provided by Cision's distribution team. “They check to make sure all of our links are working properly and review the entire release for typos before it crosses the wire,” said Poncelet. Receiving reports on the online engagement with each press release is also significant for the team. “Within hours, we have a snapshot of the audience and outlets viewing our content,” said Poncelet. Jump Media, the Royal Horse Show’s public relations team, also manages media for the Washington International Horse Show (WIHS), where the media market for equine sport is comparable to that of Toronto. 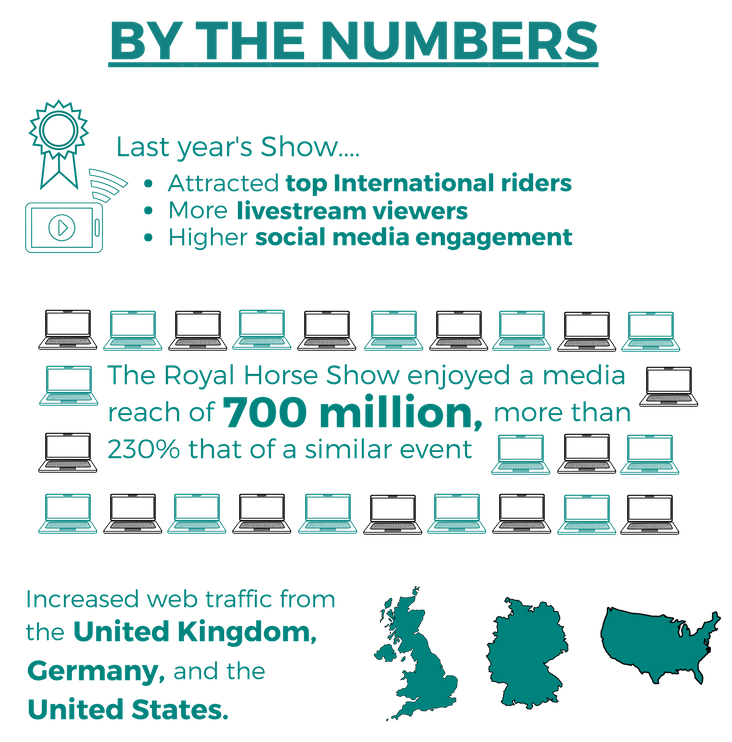 The 2016 Royal Horse Show enjoyed a media reach of 700 million while WIHS reached 300 million. The team believes that Cision Distribution by Canada Newswire was responsible for the higher reach. “We work with some of the biggest and most prestigious equestrian events worldwide, and the 2016 Royal Horse Show excelled in terms of media exposure. We experienced excellent national and international media coverage from the news releases we issued thanks to Cision’s extensive reach,” said Jennifer Ward, Jump Media. Last year’s Royal Horse Show was a success on all fronts. 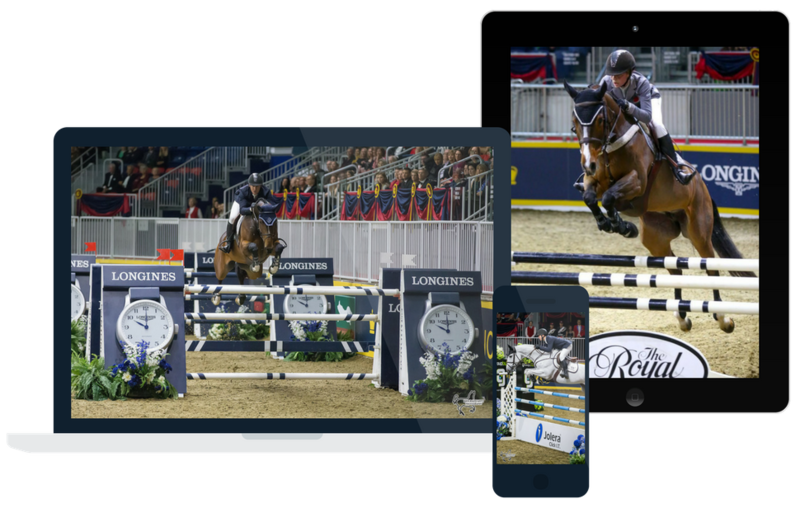 It attracted top international riders, increased media pickup, more livestream viewers and higher web and social media engagement than in previous years. The Royal Horse Show also saw an increased attendance of 4.5% versus prior years. “We experienced growth in our event attendance and engaged a broader audience,” said Poncelet. The team also noted an increase in website traffic from the United Kingdom, Germany and the U.S. Looking forward, the team strives to maintain momentum generated locally and internationally. The team will also experiment with creating and sharing more video assets with its daily results press releases. “The Royal will definitely use Cision services again,” said Poncelet.